After suffering severe frostbite on Mt McKinley in 1999, many people thought I would never climb into the high mountains again. 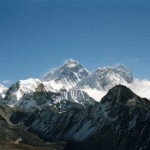 It took over three years of physical and mental recovery before I felt able to return to high altitude, and in October 2002 I travelled to the greatest mountain range in the world – The Himalayas. I hoped to climb to over 6000m above sea level, and prove to myself and others that even after losing my fingers and toes, I could still adventure and climb around the world. It was not an easy venture to consider, and took many months of serious planning to organise. Returning to the environment which once nearly cost me my life, was the most daunting challenge I had ever undertaken, but with the help and support of my family and friends I dared to face up to my fears. 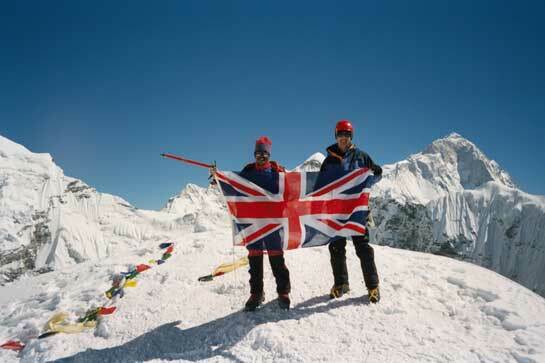 After climbing in the Alps last year I needed a new challenge, but one that was achievable with the injuries I had. 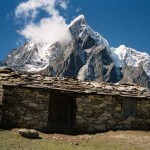 I spent many months researching possible adventures, and decided to travel to the Himalayas, but why? Would somewhere warmer such as the tropics be better for my body? Experience has taught me that my injuries need a cool dry climate to help them survive the wear and tear of an expedition. Heat, and particularly damp cause me great problems, as my skin grafts inflame and weaken when wet. I need to keep warm, but sweating causes difficulties with moisture soaking into my grafts. They can begin to break up within a few hours if kept in a poor climate. I need to keep them spotlessly clean and medicated whatever the situation. The Himalayas offer hard trekking at altitude, but with a dry and cool climate almost guaranteed it seemed and excellent place to test myself again in the high mountains of the world. 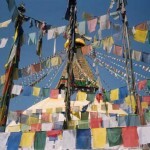 Situated in a large valley in the centre of Nepal, Kathmandu is a typical SE Asian City full of non-stop activity, overpowering pollution and noise. Street vendors selling every kind of souvenir and trinket try to catch your attention. Cars, Motorcycles and Rickshaws shoot up and down the narrow streets, touting for business or speeding on their way. Modern concrete buildings sprawl across the city in a mish-mash of conurbation, and in-between it all lie some of the most beautiful temples and pagodas anywhere in the world. 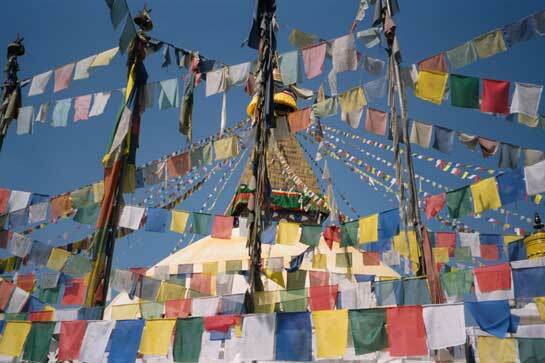 Their enormous stupas tower skyward, and are adorned by hundreds of colourful prayer flags. Unfortunately a large earthquake destroyed many of them in 1934, but the one’s which survive provide a place of prayer and peace in this chaotic city. The few days I had in the city stirred many mixed emotions – the wonder of being travelling again, the dislike of pollution, and the fear of what was to come. 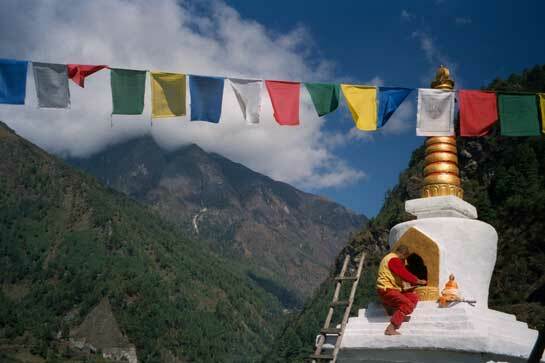 I was soon to fly out of Kathmandu to Lukla, where the adventure would begin. 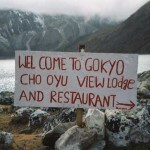 Taking part on expeditions can be very expensive. 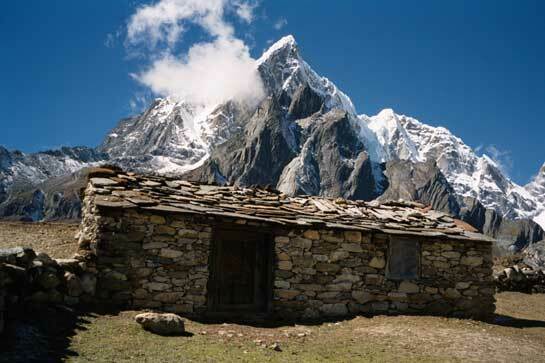 A fair estimate is that being in the mountains costs around £100 per day, when you include travel, food and porters. On top of that is the cost of your equipment and training, although there are always a great many other minor costs to add. I paid all my own personal and expedition costs, but I received equipment sponsorship from both Terra Nova and Helly Hansen. 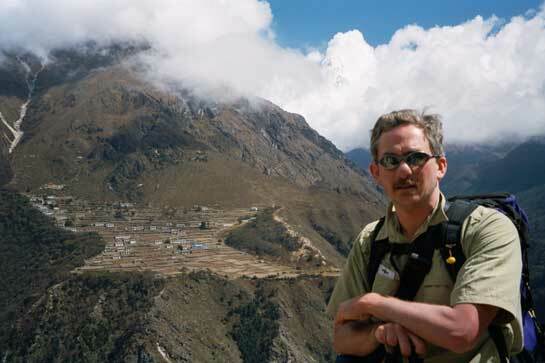 I undertook to raise funds for Cancer Research UK whilst in Nepal and received major sponsorship from East Midlands Electricity, Powergen and Kirk Hallam Homes. Fundraising for charity is an extremely rewarding task, and the final sum raised exceeded £3500. Cancer Research UK’s head office said – “People go to amazing lengths to pursue their own personal goals and raise money for charity. Cancer Research UK receives virtually no government funding and we rely on our supporters fundraising efforts to help us fund over 3000 scientists, doctors and nurses based throughout the UK. Porters have been an essential part of all mountaineering expeditions since 1907, when the British first explored Sikkim in Nepal. 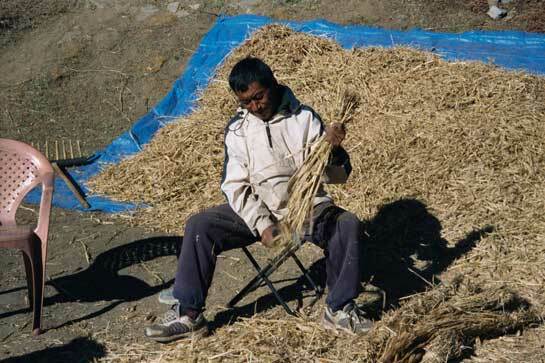 They provide the human labour which keeps all major expeditions supplied, but over many years they have been exploited and overworked. Loads were excessive, and equipment poor. 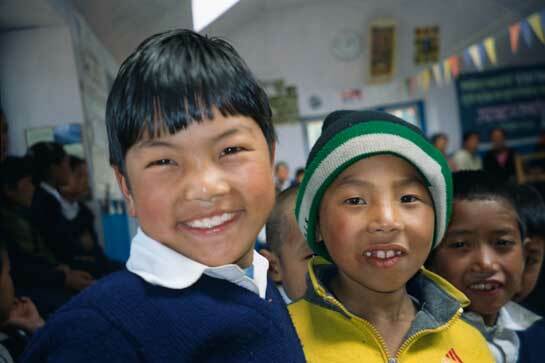 Many porters suffered frostbite, snow blindness and physical injury, but thankfully many improvements have been made to improve the situation. 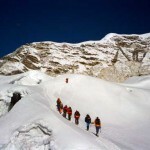 Most trekking companies now employ rules on weight and equipment to help the porters survive in the harsh mountain climate. 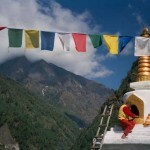 Porters also employ Yaks and Zoks to carry loads into the mountains. Zoks usually stay at the lower altitudes, whilst Yaks carry loads into the high mountains and over passes. 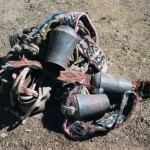 Both are well suited to the environment, and have been used for centuries by traders in the Himalayas. 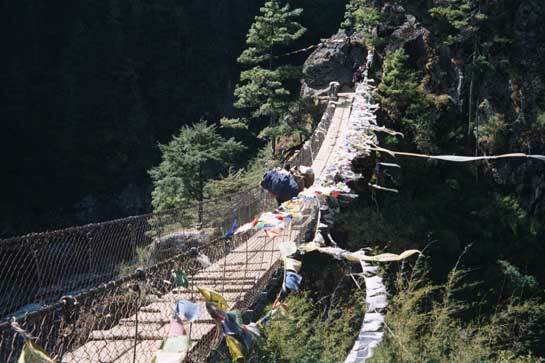 They are not to be messed with though, as many trekkers have been knocked from paths and bridges by the horns of a Zok! The animals always have right of way, and you are advised to stand uphill of them when they pass. For over three years the ghosts of Alaska have haunted my mind. 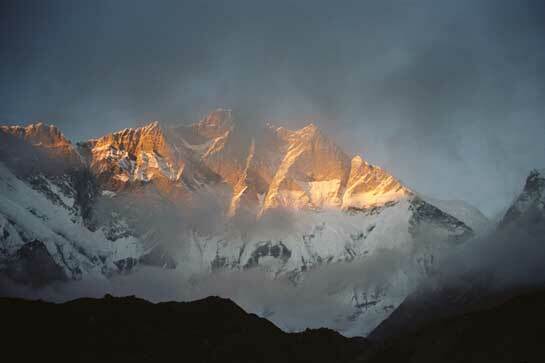 Though I suffer few nightmares at home, when I am out in the mountains a great fear returns. I thought it had been lost when I climbed in the Alps, but seeing a helicopter rescue over Nupla (opposite Namche Bazar) brought a great many feelings back. My whole body shook and I felt physically sick. I prayed that whoever it was inside the helicopter was alive and well. Over the next few days I wrote extensively about my feelings, and hoped that perhaps the expedition would help me work the ghosts out of my thoughts. I have always written a diary when I travel, and I find that putting pen to paper can help me understand my emotions, and allow me to face my fears. There were further helicopter evacuations during the trip, but my biggest shock came when a fellow climber collapsed with altitude sickness, and had to be taken to lower altitude immediately. My fears were suddenly gone, and I automatically helped where I could. 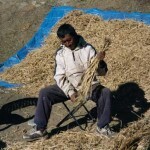 I suffered no more in Nepal. Did this incident force my fears away? I don’t know. Only time will tell. 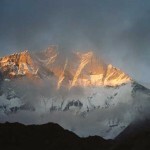 The Yeti has been a Himalayan mystery for many years. 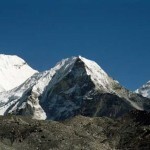 Directly translated in Nepali as “the rock living animal” it was first reported in 1889, when Major L A Waddell found large footprints in the snow in the northeastern Himalayas. 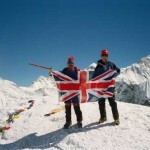 British mountaineers Eric Shipton and Michael Ward took some of the best pictures of “the footprints of the Yeti” in 1951. Each footprint was thirteen to eighteen inches long, and around eight inches wide. Shipton said the prints were too large to be a bear’s and too fresh too have been enlarged or distorted by melting. 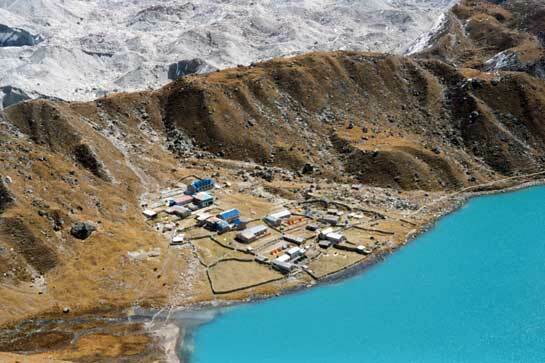 The last known incident involving a Yeti was near Gokyo, when three Yaks were mysteriously killed. 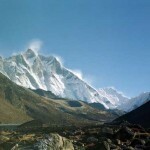 Nobody has yet encountered the Yeti face to face, but the various incidents reported by expeditions have left the mystery of Yeti more than just a fairy tale. 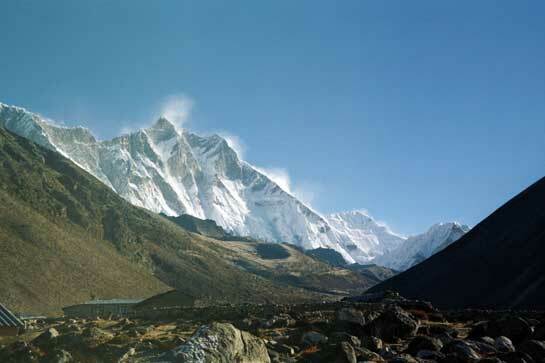 Anyone who has been to high altitude will tell you how hard it is to breathe normally when you are working your body. 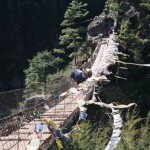 Walking and climbing become very hard, but even simple everyday tasks become difficult. Erecting your tent, or even moving around camp can become breathtaking experiences. Over time your body does adapt, but everyone reacts differently. Acclimatisation is not a job to be rushed, but after a few days your body should be able to work effectively with the meagre amounts of oxygen in the air. The higher you climb, the more time you need to acclimatise, and a basic rule of thumb is to climb no more than 300m in height everyday. Climbing the Kongma La pass was not the highest point of the trip, but it was certainly the hardest for me. The height gain was almost 1000m and the rocky screes threw up a fine dust, which made me cough repeatedly. 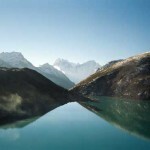 I was very happy when the climb was over and I could descend to the other side of the pass and relax in camp. 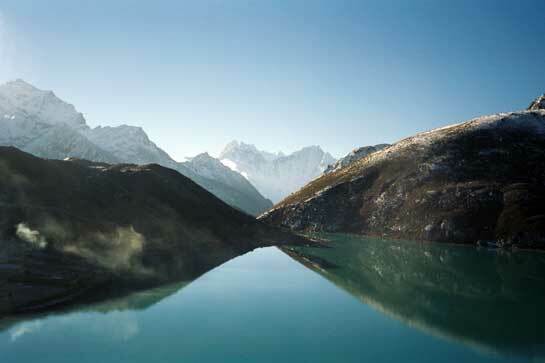 Lying to the south of the Kongma La pass stands the mountain peak of Pokalde. 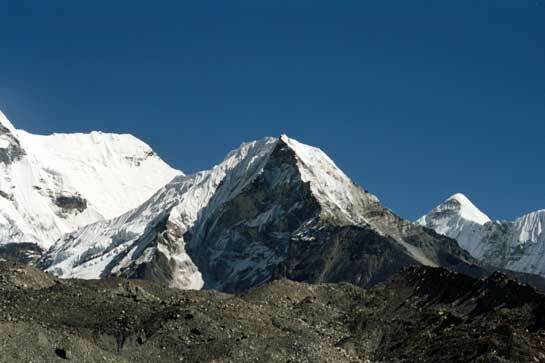 Its 5806m high summit stands on a mountain ridge made of unstable rock, which falls away with near vertical sides. 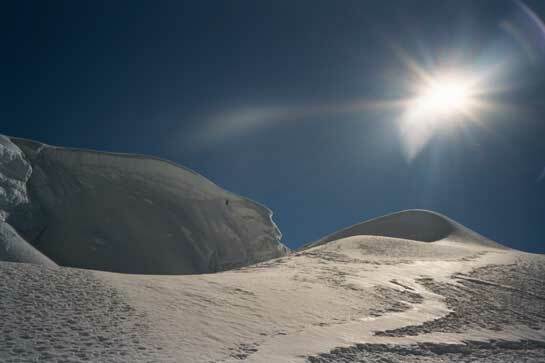 I stared up at the route from base camp and thought it looked both difficult and dangerous, but the weather conditions looked excellent, and I was eager to stand on the summit. 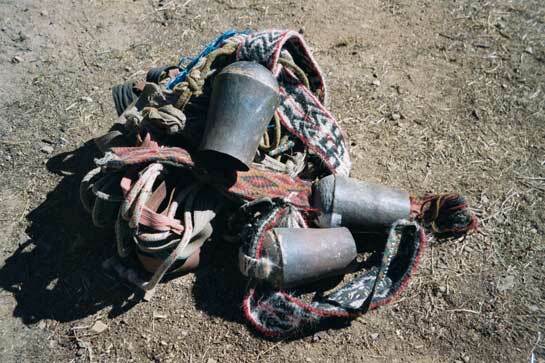 I left before dawn to begin the climb, and instantly came upon problems. 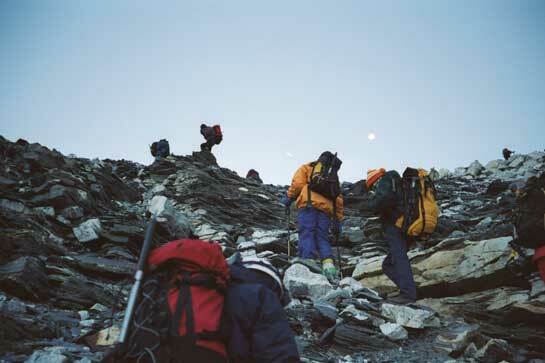 There were many other groups climbing, which made the route congested and increased the risk of rockfall. People were sliding about on the screes, and I was relieved to reach hard snow where I could at least wear crampons and stand on solid ground. After two hours of steady climbing I had almost reached the summit, but then the sheer numbers of climbers jammed the final approach, and I had to wait for over an hour for the route to clear. This did allow me to sit and survey the Himalayas from Lhotse to Makalu, before having a magical few minutes on the tiny rock summit. 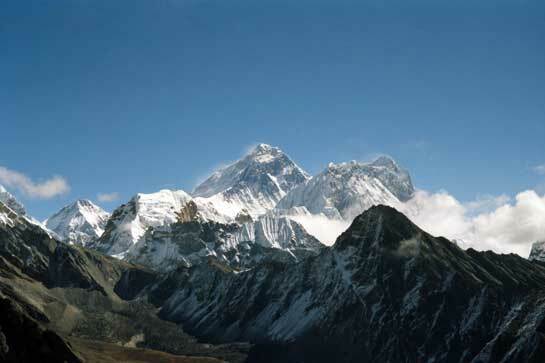 First climbed in 1953 by Eric Shipton and Tengsing Norgay, Island Peak stands surrounded by some of the greatest mountains in the world, such as Nuptse, Lhotse and Ama Dablam. 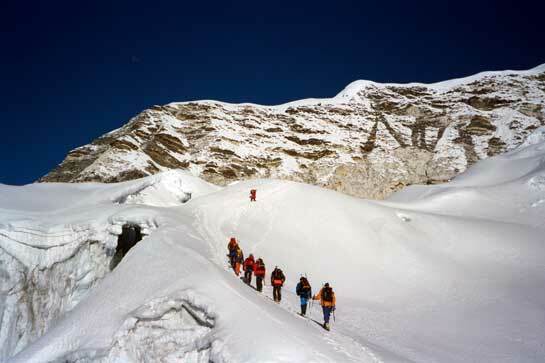 It is not a severe mountaineering challenge such as Mt McKinley, but it still provides high quality high altitude climbing. 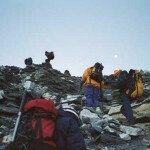 I began the climb at 4am on a freezing cold morning, in the dark, and I could feel my injuries complaining bitterly. My mind wrestled with whether or not I should turn back for base camp, but the sunrise at 6am warmed me up enough to continue climbing. I clipped on my crampons at the snow’s edge and began the long walk over the glacier up to the ice headwall – the hardest section of the climb. It took all my energy to ascend the wall, and I shed a few private tears of joy when it was over. 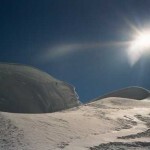 Within a few minutes I had walked along the sharp ice ridge, and I was standing on the summit, 6189m above sea level. I had done it! When my toes were amputated I found it difficult to walk on even a flat surface. With practice and patience I was able to tackle stairs, rough ground, and eventually manage to scramble and climb on rock and ice. Consistent uphill is difficult as I struggle to lift my heels up when I walk but going downhill causes me many more problems. My feet suffer hard skin and calluses on the fronts, which combined with the deep scar lines, cause me great discomfort. 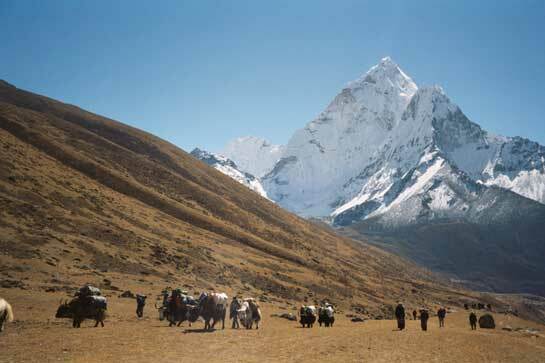 Walking into the mountains of Nepal brings constant days of steady uphill climbing, taking around three weeks. Coming back down takes three days! The consistent pounding of the descent almost crippled me, shook my back and gave me a throbbing headache. 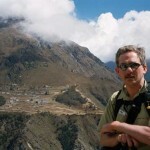 My feet were battered and sore by the time I reached Lukla, and took over a month to recover. It is a problem which will perhaps never leave me, but it will also never stop me from traveling and adventuring either. 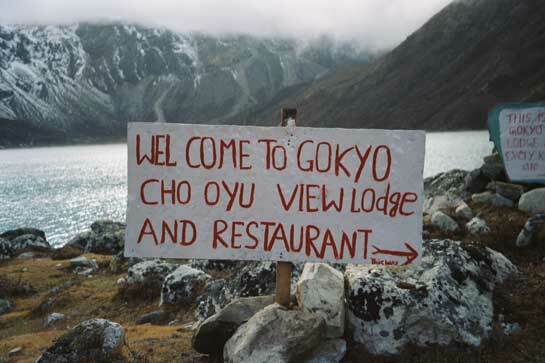 After my success in the Himalayas my mind raced onto where to go next. Adventure fills my heart to the full, and the next challenge is sometimes the inspiration my life needs. India? Greenland? Northern Canada? Borneo? All seem possible, and over the coming few months I must search for the next challenge I wish to undertake. Do I want to go back to the jungles of the world, or stay high in the mountains? Are the poles a possibility, or do I head for the heat of the tropics?